What do I use to pay? I use Etsy, Paypal, Venmo, Square Up. Choose which works best for you. Anywhere! I can make and send things to other countries, please fill out the custom order form. It depends on what you bought and where you are located. Shipping starts at a flat rate of $3.00 for the US. Spend $10 & over to get FREE SHIPPING (USA only). Check out the shipping info page for more. I do my best to keep shipping prices low so both parties don't have to spend a lot on shipping. How long before you ship the item out and how long before you're expected to receive it? All orders are shipped out on the next business day unless it is a custom order. 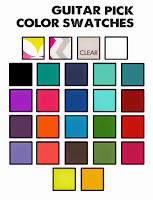 Custom orders can take anywhere from a few days to a week depending on the quantity ordered. All orders are shipped out regular mail unless other noted by purchasing a priority mail shipping upgrade. 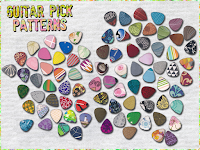 What are your guitar picks made from? I make two types of guitar pick earrings; simple ones made out of colored plastic or ones punched out of paper materials. My picks are made from re-purposed or upcycled materials. Such as: Tissue boxes and birthday cards, nylon sheeting, polypropylene, acrylic sheeting, styrene, and plastic. What is "ecoconscious" about your product? My guitar picks are made from materials you might normally find in your garbage or recycling bin. In different product packaging I see interesting patterns, and the potential of painting something to give it a new life. Even the cardboard backing the jewelry comes with is made of upcycled material. 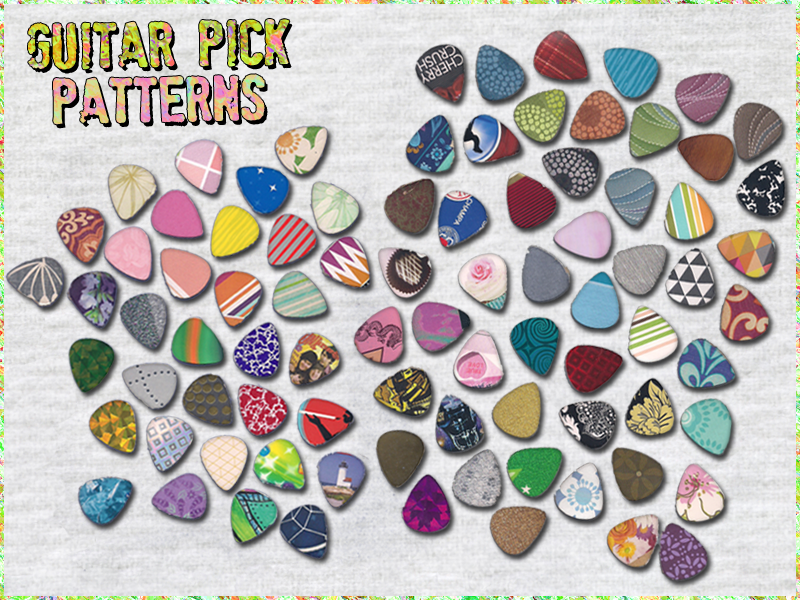 How many different colors of guitar picks do you have? Are the guitar picks usable? The ones used for jewelry as pendants are not meant to be played. However I do have packs of 6 multi-colored guitar picks which are meant to be used. Otherwise I wouldn't recommend dismantling a piece just for the guitar picks. 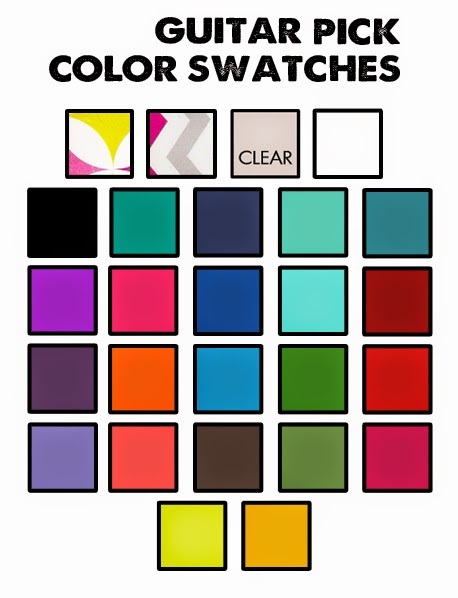 An item I was looking at is now sold out, can you make more? In most cases YES I can make more of something that has been sold. Just fill out the custom order form. Can I have the pack of guitar picks made into three pairs of earrings? No, because the items are separate. You can order a pack of guitar picks and/or a pair of custom guitar pick earrings. The product I clicked on brought me to a "Reserve item(s)" page, what does this mean? Not all of my products are listed in my Etsy shop yet. This item is available and I will be posting a custom listing for you once I get your form info. I have and make so much stuff that I can't list it all in my shop. How do I care for this jewelry? Keep your guitar pick jewelry in a cool and shady place. Jewelry may warp or even melt if left in the direct sun or if ran through the washer. Remove earrings before showering or swimming. Yep! Just fill out the custom order form once you have an idea what you want. I will get back to you with the price and other important details. It depends on what you want done, but it usually takes 1-3 days. Do you do pick up orders? I do, you must live locally. I require 60 minutes to get your order ready and we will coordinate from there. I am located in Emeryville California. If you are interested in a pick up order you will get the opportunity to make a note of that at checkout. Yes! You will see the option at check out. It's costs an additional $1.25. How do I get updates when you post new things? Go to the right side bar on this site RockResurrectionArt.com where it says "Get updates" and subscribe to my newsletter for updates. I'd like to be a model on your site or submit a picture of me wearing the jewelry. What do I do?Very cool. I am always looking for pictures of people wearing my stuff! Email me at beccajs@gmail.com Check out this page for more info! Can I submit a jewelry testimonial? Yes you can do that here. I appreciate the feedback. If your package/item arrived damaged contact me and I will make it right. Email: Beccajs@gmail.com I will honor an exchange for a new piece. This must be something else in my shop, and can include a custom order. All sales are final. Please note that I don't accept canceled orders because it costs me every time someone changes their mind. Will you be selling your jewelry out in public soon? More than likely, check out my Vending page. I usually do vending during the Summer and Holiday season.